This outstanding itinerary provides experienced underwater enthusiasts with an exceptional diving experience, plus enough free time on land to relax and enjoy two of the most popular and most beautiful of the Cycladic Islands, Mykonos and Santorini. In fact, this is the perfect itinerary for couples and families, where only one member wishes to dive ... the non-divers will not be bored! In addition, if you are not a certified diver but would like to learn while in Greece, let us know and we'll arrange it for you. 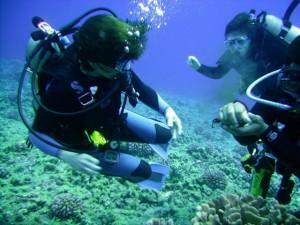 Our Dive Clubs are fully-functional training facilities as well, with excellent credentials. Arrival at Athens International Airport. Meet our representative and transfer to your hotel. The rest of the day is at your leisure. 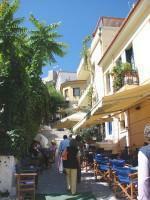 Enjoy the marvelous area of Plaka, and plan to have dinner at one of the traditional tavernas in this lovely old town. Overnight Athens. In the morning after breakfast, transfer by car to our scuba diving club. Drive along the coastal road to a beautiful location. First dive at 10:30, time for lunch and then the second dive at 15:00. Your pick-up by our driver is at 19:00, so you have time to shower and change. Evening at leisure. Overnight Athens. 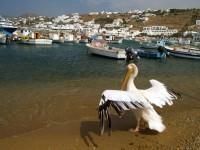 In the morning, transfer by car to the port of Piraeus for your boat trip to Mykonos. The highspeed will do the trip in under 4 hours. 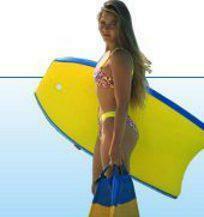 Upon arrival, meet our representative and transfer to your hotel. Rest of the day at leisure to to stroll through the town, admire the incredible Cycladic architecture, and certainly get lost in its maze of tiny streets! Overnight Mykonos. In the morning after breakfast, our driver will pick you up from your hotel and take you to our scuba diving club. The first dive is at 12:00, with lunch afterward, and the second dive at 15:00. Our driver will pick you up at 19:00, so you have plenty of time to shower and change. Evening at leisure. Overnight Mykonos. 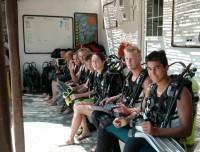 In the morning after breakfast, transfer to the dive club and have 2 boat dives at different locations. You might consult with the owner of the dive club to do a deeper dive, a wreck dive, or many of the other specialties they offer. Return at 19:00; evening at leisure. Overnight Mykonos. Morning at leisure. 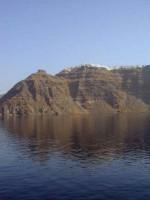 After hotel check-out, our driver will transfer you to the port for your boat trip to Santorini. The catamaran does the trip in 3 hours, and you will be there in time for your first Santorinian sunset. 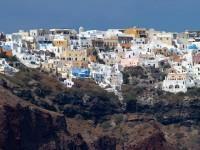 Rest of the day at leisure to explore the beauty of Fira Town, and to walk along the rim of the caldera. Overnight Santorini. In the morning after breakfast, transfer to our scuba diving club. The first dive is at 10:00, and the second is at 14:00. Our driver will return at 18:00 to pick you up and take you back to your hotel. Evening at leisure. Overnight Santorini. 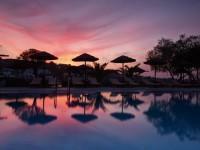 Free day to explore Santorini or just relax. The main town, Fira, is a bustling place, which invites everyone to shop, stroll through its streets, or enjoy a meal at one of the restaurants overlooking the volcanic site. Oia, the traditional village with the famous sunset, is an essential visit that no one should miss. We have some excellent optional excursions available, by land and by sea. One of the most exciting is the visit to the volcano, with a swim in the hot sulphur springs. The winery visit is a must for lovers of fine wine! Overnight Santorini. Meet our representative and transfer to the airport for your domestic flight to Athens, in time to connect with your international flight home.